Blowout Sale! Save 52% on the FM Transmitter Bluetooth Car Kit Music Player, SOONHUA Dual USB Car Charger Support Micro SD/TF Card USB Flash Drive Read Hands Free Call for iPhone Android Smartphone Tablet MP3 Player by SOONHUA at DJ Luu. Hurry! Limited time offer. Offer valid only while supplies last. This bluetooth car kit is a high quality cell phone car kit, works great, easy to set up and use, easy connection, music sound quality is awesome. This bluetooth car kit is a high quality cell phone car kit, works great, easy to set up and use, easy connection, music sound quality is awesome. Multipurpose car kits, with FM transmitter, MP3 player, dual USB car charger micro SD/TF card USB flash drive read support hands free fall function. Wide Compatibility:SOONHUA Bluetooth Transmitter works with all kinds of popular smart phones the market ( iPhone/Android mobile phones like Samsung,HTC, LG ,Huawei,Sony,etc) and any other electronic devices，such as MP3, MP4 Player, and tablet PCs. Dual USB Charging Ports Μti-Playing Modes: It allows you to transmit the music file from your phone to your car after adjusting the frequency.The USB port with music symbol can read music file from the inserted U disk and TF card. The 3.1A in total charging current allow you to charge 2 devices at one time. The power comes from cigarette lighter so it is suitable for most cars. Bluetooth Function for Hands-Free Calling:One simple button and a built-in mic for your convenient hands-free call and music transferring.Just one click to hang up/off when receiving a call.When call comes,the music mode will automatically transfer to hands-free calling mode. Convenient Music Play:High quality sound for your listening with the lossless high quality audio decoding technology. The memory function enable it to play the last played song when power the charger on with the memory function.The digital LED screen will display the voltage of your car and serial number of song and frequency point. Concise Device and Multiple Protection The Piano baking finish,UV processing and quality ABS material make it a quality and exquisite device. 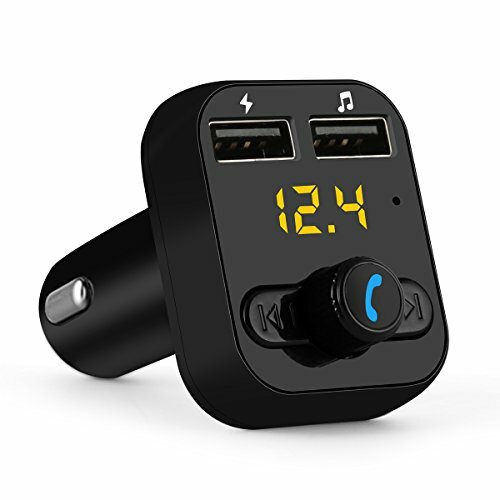 To ensure safety of the charging process and the connected devices,this FM transmitter Bluetooth car kit provides multiple safety protection,which includes over-current,over-voltage,over-temperature,etc. If you have any questions about this product by SOONHUA, contact us by completing and submitting the form below. If you are looking for a specif part number, please include it with your message.